I am going to change my front fork springs with hyperpro progressive springs SP-HO10-SSA012. I bought them and got a manual for the installation. The manual says that I can not use the 55mm standard preload bush. I do not understand which bushing they are talking about. Has anyone already done this or does anyone know which bushing is involved? It's #4, the spacer. Your new springs must be longer than the factory ones. When you take the top retaining cap off, #18, be careful, its under slight pressure. things will fly around your shop when it is suddenly free. 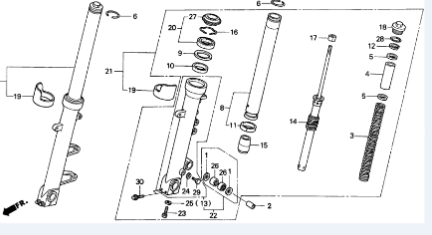 How do the progressief springs go in compresed windings down or up ? When installing progressive springs, they recommend the tighter coils to be up top. However, I doubt it makes a difference. The spring rate would stay the same in either direction. the more mass, the higher of center of gravity. argue about the most stupid things. I put them with the tighter coils down the ones that came out were the same had the coils down to . Was a litle bit of work for my first time but all went wel also changed my frontwheel bearings. Now i put hyperpro sring in the front fork with the tight coils down i took the upper springcollar out as suggested by hyperpro . so all thats left in the forks is the compleet fork damper which is connected to the forktube cap and bolted with the bolt on the underside of the fork i put the oil in and the spring and screwd the forktube cap on . I have no leaks anymore because i also changed the seals . I hoop this is the right way anybody nows its mounted right like this ? Anybody know if this is oké like i did ?